The Golden Globe nominated film, Lady Bird, is lovely, quirky and sentimental. It is about a young girl’s love/hate relationship with her hometown of Sacramento. As it turns out, the city is not just a backdrop, but one of the stars of the movie. If you are from California, you know our state capitol often gets a bad rap, as a boring town, that pales in comparison to flashier places like Los Angeles and San Francisco. Lady Bird’s affectionate tribute is making everyone take a second look at Sacramento. Years ago, we traveled to Sacramento and visited our friend Patrick’s restaurant, Mulvaney’s Bank and Loan. We had a wonderful dinner outside on the patio, and when it was time for dessert, Patrick insisted we try the homemade Ding Dongs. My kids were little and had never heard of, nor tasted the nostalgic Hostess treats. My son was a picky eater at the time and he declined, but they sent some out anyway. And so, Ding Dongs and our amazing dinner at Mulvaney’s will forever remind us of our trip to Sacramento. We realized, just like Lady Bird did, that there are things in and about Sacramento, that you just can’t find anywhere else. The Golden Globes, which airs tonight at 5:00 pm on tk and repeats at 8:00 pm, is always a unique event, and this year will be no exception. 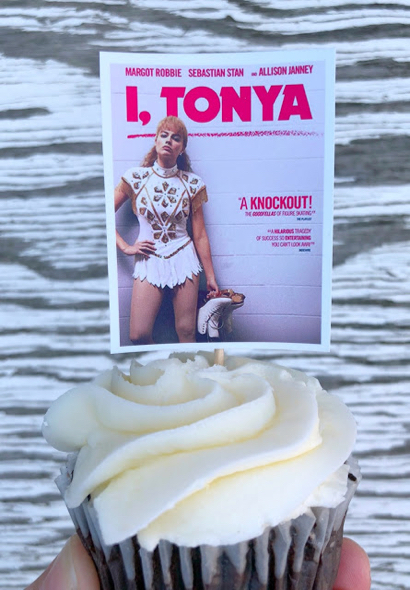 I mean really, did you ever think there would be a reason to put Tonya Harding on a cupcake? Enjoy the show! Print toppers for all the nominated movies here. Menlo Park resident Alexis Murphy’s website is Jac o’ lyn Murphy, where this post originally appeared; used with permission.